THE “SULTAN OF SWAT” GETS READY TO DO IT AGAIN. 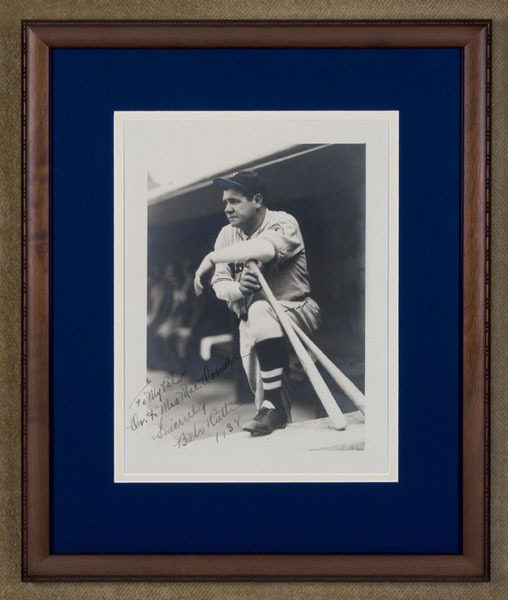 Signed Photograph, “To My Pals / Dr. & Mrs. Mac Donald / Sincerely / Babe Ruth / 1938.” The black and white photograph (gelatin silver print) measures 7 inches wide by 10 inches high. The photograph, taken by renowned sports photographer George Burke, shows “The Babe,” wearing his Boston Braves uniform, in the dugout, one foot on the concrete barrier surrounding the dugout, his left arm resting on one bat, his right hand holding another, with a look of concentration on his face. George Herman Ruth, Jr., often called the greatest baseball player in history in a sport of many “great” players, rose to fame during the “Roaring Twenties” when his home run hitting prowess and charismatic personality suited the times. The popularity of baseball exploded in the 1920s, largely due to his influence. His big swing led to escalating home run totals that not only excited fans but helped baseball evolve from a low-scoring, speed-dominated game to a high-scoring power game. Babe Ruth had a large appetite for living, in part thanks to his deprived childhood. Raised from the age of seven at the St. Mary’s Industrial School for Boys, which was part orphanage, part trade school, part reform school, he gained a mentor (though not a father substitute, strictly speaking) and was introduced to baseball for which he showed great aptitude. Off the field, Babe Ruth was known for his charity work and his love of a good party or a good joke. Not the most refined individual, his fans forgave him everything. They loved his heart and they knew that when he swung that bat, his whole heart was in it. Framed (with a cream inner mat and a navy outer mat in a wood frame) dimensions: 15 inches wide by 18 1/8 inches high.